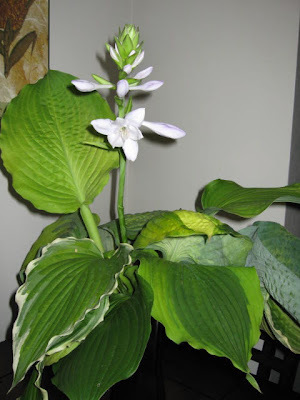 Many people who have hostas in their yard either ignore hosta flowers or cut them off. I remember when I was a kid I used to walk through our yard "popping" all of the flower buds before they opened up. I called them balloon flowers back then. Who knew that I would go from popping balloon flowers to where I am now? Today I was walking through the yard and smelled something wonderful. Well it was the flowers from my hosta 'Cathedral Windows'. Not all hosta blooms have a scent to them, but the ones that do smell faintly like lily of the valley to me. So next time you see a hosta in bloom (especially if it's a large white flower) bed down and smell the hosta, you might be pleasantly surprised.